Aluminum bike pedals with strap, fit for any item need 9/16 '' bike pedals. 520.00 grams. UNIVERSAL STANDARD: Fit for any mountain bike, road bike,exercise bike with thread 9/16". Please check the size you need before ordering. STURDY MATERIAL: The body made of aluminum,more durable than other plastic bike pedals. 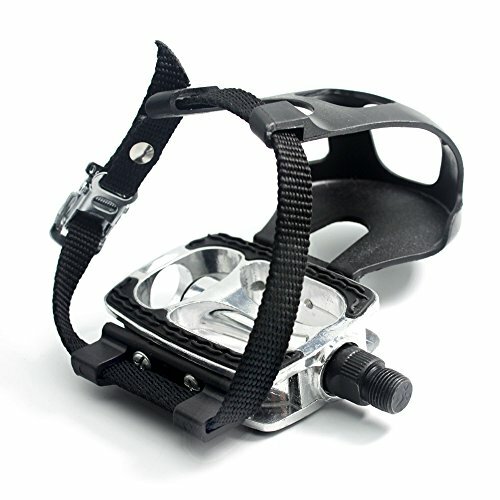 ADJUSTMENT SYSTEM: Adjust your feet by releasing or fastening the buckle on the strap. ANTI-SLIP DESIGN: Equipped with strap plus rubber anti-slip belt, ensure your feet stay in place firmly. BUY WITH CONFIDENCE: The pedals come with 365 days warranty, any doubt or issue, please feel free to contact us. Sunlite Barefoot Cruiser Pedals, 1/2"